So speak encouraging words to one another. no one left out, no one left behind. just keep on doing it. Nobody can live in isolation. We are designed for relationship. Relationships are the single most impacting feature that hurts us the most, but also the intended agent of God that results in our greatest healing. No matter how broken you are, forgiveness and love can bring restoration to many hearts. Over the past few weeks, I have been reflecting on kindness and gentleness, two fruit of the Spirit found in Galatians 5. Because of this, I started musing on the most impacting characteristics I have found in people's lives. I realised, whether you are casually chatting to a friend, passing a stranger in the street or addressing a corporate audience, there are some virtues that can have a profound effect on the souls of people. These virtues add value to people and have the potential to lift them out of the darkest pits of life. 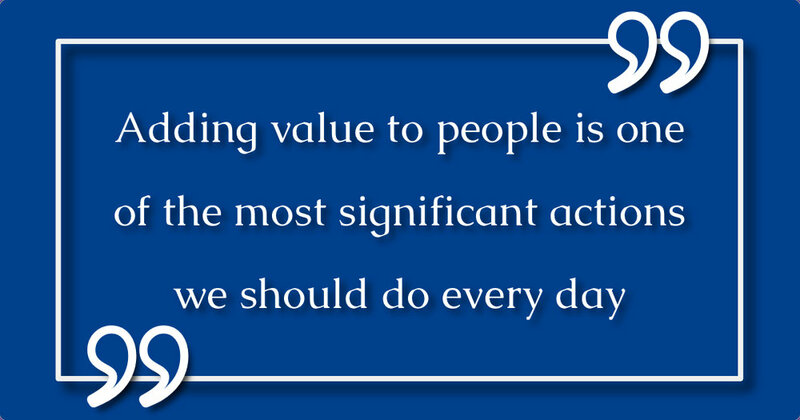 Adding value to people is one of the most significant actions we should do every day. Several people believe they have nothing worth adding to another's life. Excuses like lack of knowledge or success become their identity and reality. Because of these limiting beliefs, they sit in isolation and fail to impact the world around them in the most basic manner: kindness. When you go through a day without showing God's kindness to someone, you should reflect upon the lack of value of that day. Even your worst enemy needs kindness. Kindness starts with a choice, a thought, a decision to act like Jesus in the most basic manner. If you don't know how to be kind, just smile to every person you see today. Never look at someone without a smile on your face. Then simplyfollow the smile. It will guide you toward kindness. Have you ever had an argument with someone and they respond with a soft tone and a smile? There are few things that have the power to disarm contention like a gentle demeanour. Gentleness requires a strength of character. This virtue is not for the faint-hearted. It demands inner security from those who have it on offer. You have to respond to your God-created nature, not react to your sinful desires. Gentleness has the ability to add value to people when their own share prices plummet in the market of trust. Gentleness is one of those rare aspects of life that assures a win-win result in any social transaction. Adding value to people in a gentle spirit will also ensure increased self-value. Thinking of other's higher than yourself will keep you in an attitude of servanthood. We have been called to please God and serve people, instead of to serve God and please people. When I want to please God, I will serve those whom He has created in His image. To be able to see everyone in God's image, we need to approach people with the respect they deserve as God's children. Respect requires a disposition of humility. You can only respect those who you value. Unless you consider a person an image bearer of God, you cannot add value to them. Respect is like an escalator that lifts a person to a higher level of life without them putting any energy into it. Be an escalator to someone every day. In a world where humans have been identified as monkeys with lucky thumbs, personal identity gets defined by the number of bananas you possess instead of which family you will be with forever. We spend way too much energy thinking about time than about eternity. One of the best deposits you can make in any human heart is the promise of eternal hope. God's Sabbath rest is found in the knowledge that He has already secured your tomorrow. Godly hope is the antidote to the worry of tomorrow's uncertainty. Adding the value of hope to a person's life is like an oasis in a warm desert. It doesn't matter how heated the stresses of life gets, an oasis of hope can refresh even the greatest cynic. John Calvin rightly said, "The human heart is an idol factory". This is the reason we need the Holy Spirit within our hearts. Idols are never kind and gentle. They are selfish and cruel. If your heart does not belong to Jesus and is not frequently replenished with a dose of the Holy Spirit's presence, you will end up with a deceptive attitude thinking yourself greater than you truly are. This rotten smell of pride and deception in your attitude will permeate your relationships. Humility is attractive, irresistible and powerful. This compelling virtue is kind, will lay hold of a person's heart with gentleness, and respectfully instil hope in the most desperate of souls. To add value to someone created in God's image is a privilege and can only be done effectively with Godly humility. Like this verse, in the beginning, reads, "speak encouraging words to one another". Everybody needs God's love. You are His chosen vessel to carry these virtues. Take up the honour of delivering this value-adding gift to the world. Newer PostAre you in the right environment? Older PostWas it the devil?